Amidst the hundreds making their way to the healing garden to honor the 58 killed in the 1 October attack, Daniel Rosales was searching for two people knowing he was going to cry the second he found them. Rosales hadn't seen the Gary and Cathy Patton in person for 365 days and back then he didn't know their names, he just knew they needed help. "All of a sudden Daniel puts his hand on my shoulder and says you've got to get out of here," Gary Patton said. That's what Gary Patton says shook he and his wife Cathy out of their shock as Rosales pointed them in the direction away from the gunfire. "I thoroughly believe he saved our lives," Gary Patton said. But they didn't see him again before leaving for California and Rosales didn't know if he did enough that night. "I thought I didn't help enough," Rosales said. But months later, the Pattons tracked Rosales through the Route 91 survivors' pages. They only had a picture from the concert to aid in that effort. 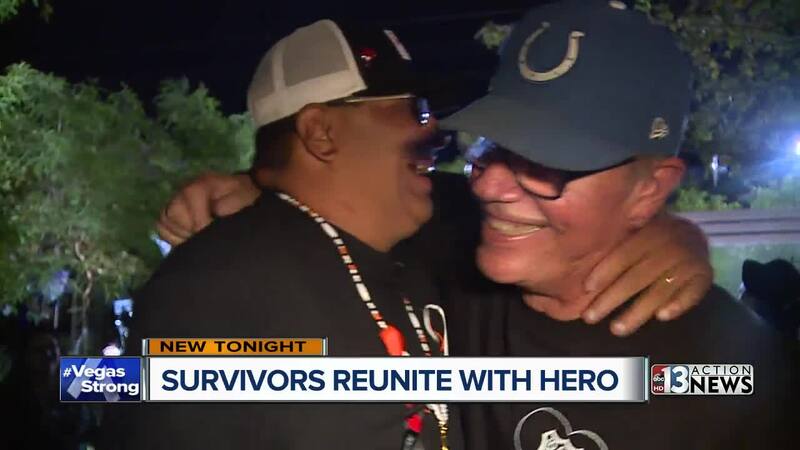 They reached out and organized the reunion on their first trip back to Las Vegas, which just happened to coincide with the one-year anniversary of them finding their hero. "This is one of those steps to see Daniel and put closure on this," Gary Patton said. Rosales said the reunion also brought him closure after a tough year.